i've never seen pictures such as these. they are so beautiful, you are so talented photographer! i'm amazed of your work. Great captures, especially the last one. Their bright red color really stand out. Great job on the macros! So shiny and red, each seems to be endowed with individual markings. Ah, 'tis spring and love is in the air. Wow, great close-ups. Looks like one of the lady bugs is also a taxi. Ahhh... love is in the air :-) These are wonderful photos - such clarity and detail. 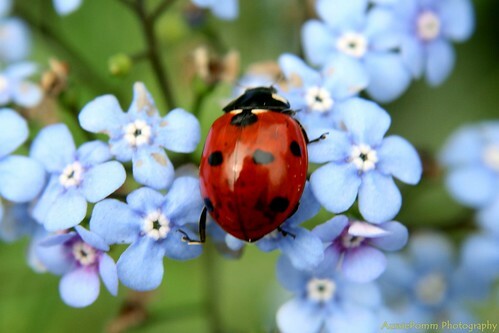 Ladybirds are my favourite creatures in the garden, so thank you for those remarkable up-close-and-personal shots. Brilliant shots, i don't think ive seen them that close up before. I love the bright red against the soft blue - beautiful. Nice shots! I like the pictures. Marvelous! such a well loved bug. 5 Day Easter Weekend, WOW! London to Ghent, via Brussels!